Connecticut Day at the 2017 Big E.
You may love the Avenue of States but not the midway of carnival rides. You may wait all year for the famous Big E Cream Puff or shudder at the health risks of all the fried fair food (new this year: Deep Fried Pop Tarts). 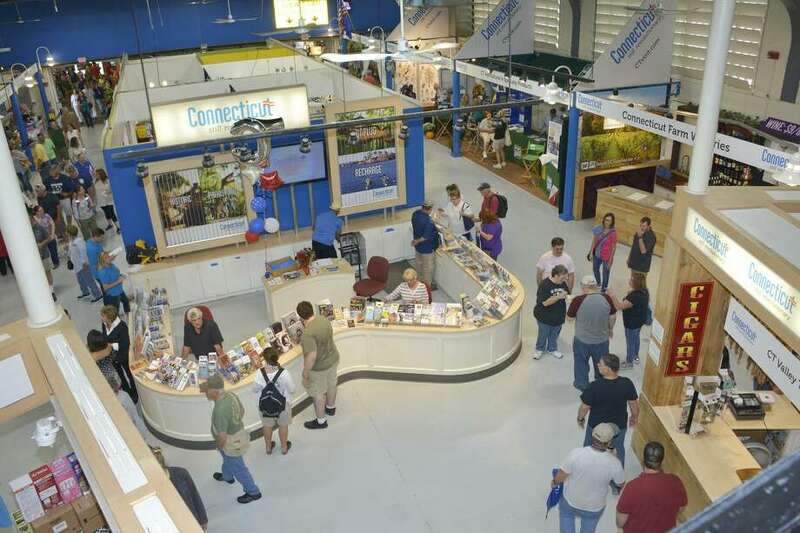 But as long as you bring your love for New England and a wad of spending money, you’ll find something to celebrate at the latest Eastern States Exposition, running Friday, Sept. 14, through Sept. 30 in in West Springfield, Massachusetts. Connecticut Day is Wednesday, Sept. 19, when New York and New Jersey drivers in mini-cars will weave in and out of the nightly parade to simulate their toll-free sprints on our highways. OK, we’re kidding about that part! But a weekday visit to the Big E might just be a more relaxing strategy than a weekend plan. The 17-day event reported record attendance of 1.5 million people in 2017. The Big E is an annual point of pride (and traffic concern) for northern Connecticut and western Massachusetts, of course. but there should be an extra spring in the step of locals due to the recent opening of MGM Springfield casino, which has brought more than 1,000 full-time jobs to downtown Springfield and provides reason for a multiday visit combined with the Big E.
The Avenue of the States is where you can learn about New England specialties and history (spend some time appreciating the relocated buildings of Storrowton Village). The Avenue will mark the fall season on Harvest New England Day Sept. 26 from 10 a.m. to 7 p.m. Lawns of each state building will feature native products and specialty vendors. But back to the fair food, which draws thousands to the Big E like a Red Lobster TV ad squeezing lemon juice on shrimp in slow motion. You can’t eat the following one, although you may want to grab a flat knife and a huge corn muffin for Jim Victor and Marie Pelton’s artful “Big E On Parade,’ a sculpture made from 600 pounds of butter. There’s a new barn that will double the size of the agricultural area that includes the Farmers Market and Wine Barn area, featuring vino, cheeses and ciders. The new part will allow more demos, such as spinning and weaving (not the in-traffic variety) and cooking demos, along with competition-winning cheeses and jellies. Thank you for baby cheeses. There’s more, too, including horse-show competitions, a Circus Spectacular at 1, 4 and 7 p.m., Camel Kingdom, Collector Car Live and shows on The Big E’s Xfinity arena and Court of Honor Stage — featuring names such as The Marshall Tucker Band, B.B. King’s Blues Band featuring Tito Jackson, Ice-T, The Beach Boys, NRBQ, Hanson and — on Connecticut Day — Tony Orlando.